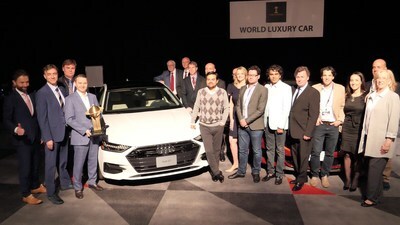 NEW YORK, April 17, 2019 /PRNewswire/ — The Road to the World Car Awards journey concluded today with a grande finale awards ceremony and press conference that opened the New York International Auto Show. The Audi A7 was declared the 2019 World Luxury Car. This is the second consecutive World Luxury Car win for AUDI AG. The A8 was last year’s winner in this category. Today’s win marks the 10th time that AUDI AG has won a World Car award in our 15 year history. The company previously won the World Car of the Year title in 2014 (Audi A3) and the very first World Car of the Year award in 2005 (Audi A6). As of today, AUDI AG continues to hold the record for the most won World Car Awards. This year’s winner was chosen from an initial entry list of five prestigious cars from all over the world, then a short list of three finalists as announced in Geneva on March 5th. The 2019 Top Three in the World finalists are the Audi A7, the Audi Q8 and the BMW 8 Series. Previous World Luxury Car winners were the Audi A8 (2018), the Mercedes-Benz E-Class (2017), the BMW 7 Series (2016), the Mercedes-Benz S Coupé (2015) and the Mercedes-Benz S-Class (2014). The award was first created in 2014 to acknowledge higher-priced premium models selling in more limited numbers worldwide. Vehicles were selected and voted on by an international jury panel comprised of 86 prominent automotive journalists from 24 countries around the world. Each juror was appointed by the World Car Steering Committee on the basis of his or her expertise, experience, credibility, and influence. The international accounting firm KPMG tabulates the jurors’ ballots. The Road to the World Car Awards is an annual journey in partnership with the New York International Auto Show. The journey follows our international journalists as they test-drive, and vote on, the 2019 eligible vehicles. The official launch took place in Paris on October 2nd and ended with today’s winners’ press conference. World Car made several stops along the way: our fifth annual L.A. Test Drives event concluded the last week of November. The event was an outstanding success with 48 jurors attending from 18 different countries across the six day event. ZF was the event’s exclusive host. Of course, The Road To the World Car Awards doesn’t really stop. Just a few weeks from now the World Car Garage will be staged for the fourth year at the London Motor & Tech Show May 16-19; offering a glimpse of the 2020 contenders as well as celebrating the 2019 winners. PHOTOS and VIDEOS: event photos will be posted the morning of Wednesday, April 17th to www.worldcarawards.com. Photos of the top three car finalists in all categories are already on the web site’s home page. Videos from the event will be posted by Wednesday afternoon. BEGAN IN PARIS OCTOBER 2, 2018. ENDS IN NEW YORK APRIL 17, 2019. For additional information visit our web site (www.worldcarawards.com). Now entering their 15th year, the annual World Car Awards are the number one awards program in the world for the sixth consecutive year based on Prime Research’s 2018 media report. The awards were inaugurated in 2003, and officially launched in January 2004, to reflect the reality of the global marketplace, as well as to recognize, reward and inspire excellence, leadership and innovation in a rapidly changing automotive industry. The awards are intended to complement, not compete, with existing national and regional Car of the Year programs. The awards are administered by a not-for-profit association, under the guidance of an awards management and advisory group of prominent automotive journalists from Asia, Europe, and North America. Peter Lyon (Co-chair, World Car Awards Program – Japan), Mike Rutherford (Co-chair, World Car Awards Program – UK), Jens Meiners (Partnership director – Germany), Tim Stevens (director – USA), Siddharth Vinayak Patankar (director – India) and Gerry Malloy (president, WCA Association). Owned and operated by the Greater New York Automobile Dealers Association, the New York Auto Show is an awesome combination of new ideas, technological innovation, exceptional concept cars and nearly 1,000 of the latest new cars and trucks. Over one million visitors are expected to visit the show this year to see what is truly possible from the automotive industry.